It’s that time of year again. In some cases, people have lined up for hours to select their numbers for the 2009 edition of Spain’s Christmas Lottery, all hoping to win “El Gordo”, the largest of all prizes. A few will win, but most will lose, all enjoying the days of discussion leading up to the drawing as well as a few anxious hours in front of the TV on Tuesday morning as the tiny wooden balls are selected and their numbers sung in monotonous repetition by uniformed school children. At 8am, December 22nd, Spain’s lottery commission will host its annual Christmas lottery, “Lotería de Navidad de España“, whose largest pay-outs go to the winners of “El Gordo” (1 chance in 85,000 to win “El Gordo”). Lesser numbers selected bring lesser winnings. Interestingly enough (at least to me), any number selected has a 15% chance of winning SOMETHING. 2.3 BILLION Euros is the total, overall payout of the combined winning numbers. Wow. The lottery usually lasts about 3 to 3.5 hours and can be watched locally on TVE (nearly all local channels cover it) or online at RTV.es. Explanation of “How it works”: Lottery tickets contain 5 numbers and there are 10 tickets for each number. The ten tickets of the same number are called “a series”. So, for example, I could buy one ticket with the number 12345 or I could buy 3 tickets with the number of 123455. Or, if I chose, I could buy the entire 10-ticket series of 12345. Each individual ticket costs 20 Euros and is called “un décimo“, or “one tenth” of the series. The entire series of any given number would then cost 200 Euros. So when a winning number comes up you would either win 1-tenth of the total winnings if you held ONE ticket or you would win 100% of the winnings if you held the entire series of 10-tickets. Explanation of “The Drawing”: Two big tumblers, one bigger than the other, contains thousands of tiny wooden balls. The child collecting the ball from the big tumbler calls out the lottery number in its entirety while the child collecting the ball from the small tumbler calls out the kind of prize associated with it which, in the vast majority of the cases, is “Mil Euros“. When one of the larger prizes is won, anything larger than “Mil Euros“, the children carry the balls over to the table of officials to verify the number and the associated prize. 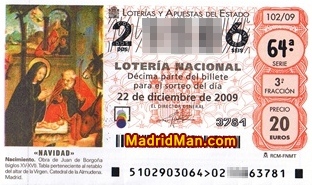 See video below of 2008’s lottery when “El Gordo” is selected as well as the “normal chant” of “Mil Euros“. As I’ve now done for the last 2 years, I bought a number of tickets for me and some friends, all of which would share in any of the winnings. This year I went to the local lottery shop, where there was absolutely no line, and asked for 5 tickets all ending in the same number. (here’s where my mistake was made) Obviously, unless two humans can read each others minds mistakes are often made in communication. So the woman at the counter did indeed give me 5 tickets which ended in my chosen number – but ALL 5 tickets were identical! My intention, understandably misunderstood by the clerk, was to have 5 tickets with distinct numbers but all ending in the same number. I’d already left and walked 50 meters before realizing my mistake. HMPH! Sure, if we win, we’ll win 50% of the total sum for that series but it also lowers our chance of winning anything. 100 Euros down the drain? Probably, in whichever case. So I went back the next day and got 5 MORE tickets, ending in 5 different numbers, assuring that I’d get tickets from 5 different series and thereby INCREASING my chances of winning SOMETHING. So I spent 200 Euros for gifts to my friends on Christmas, none of which are likely to amount to anything but it’s a nice, fun gift. And, as I’m told, it’s “very Spanish” to gift Christmas lottery tickets to friends and family. If you’ve bought your “décimos” for this years’ Spanish Christmas Lottery, I wish you the best of luck. If not, enjoy watching it live for awhile. Sure, the repetition can get boring – I understand that – but the most fun comes NOT from watching the actual numbers chosen but the celebrations of the winners which usually takes place towards the end of the lottery or just afterwards. Then, you see people in bars with COPIES of their winning tickets, being showered with bottles of (cheap?) champagne, dancing among their (new) best friends or (now) close relatives. I also like the interviews during the lottery of people in the street telling what they would do should they win. The answers are almost identical every year; they’d buy a new house or pay off the old one, they’d quit their jobs, they’d pay bills, they’d help family and those less fortunate, and on and on. What I’d like to see are stories about past winners and how their lives actually changed with their new-found wealth. Did they really pay off the house? Did they really give money to poorer family members? Did the money make them crazy? Did they become cocaine addicts? Did they squander it all? Or did they start companies or invest it wisely for their future and the future generations? Be sure to check back here on Tuesday for an UPDATE of the day’s lottery drawings! “Spain’s Christmas Lottery is still ‘El Gordo‘”, 2009 article, in English, by Cristina Mateo-Yanguas. “Asi es el Sorteo de “El Gordo“: Graphical step-by-step procedure, IN SPANISH, of lottery number selection. LOTTERY NUMBER CHECK and Christmas Lottery articles at ElPais.com (in Spanish). elGordo.com: Check lottery ticket numbers (in Spanish) as well as BUY lottery tickets online. This entry was posted in About Spain, Money and tagged Christmas, Christmas Lottery, décimo, el gordo, gordo, lotería, Loteria de Navidad, Lottery, navidad, numbers, Spain, win, winning. Bookmark the permalink.